In our human wisdom, we would settle for relational détente, but God wants to bring us to the end of ourselves so that we would see our need for a relationship with him as well as with others. Every painful thing we experience in relationships is meant to remind us of our need for him. And every good thing we experience is meant to be a metaphor of what we can only find in him. Letting go of a moment of hurt. Getting angry at the way our teenagers complicate our lives. Avoiding conflict out of fear. Being too political at work. Being resigned to broken relationships that could be healed. Gossiping about people. Lying out of fear of what others will think. Compromising our convictions to win others’ approval. Pursuing comfortable relationships and avoiding difficult ones. Doubting God when our relationships are messy. Controlling relationships out of a desire for security. Blowing up at people when our agendas are trampled. All of us need a clearer sense of what it means to put first things first and how Jesus enables us to do that. We also need to understand what practical changes are needed to create a new agenda for our relationships and what concrete steps we need to take as we seek to please God. Lane, Timothy S.; Paul David Tripp (2006-11-01). 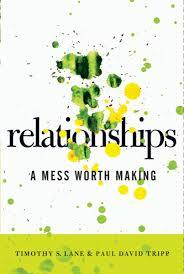 Relationships: A Mess Worth Making (p. 8). New Growth Press. Kindle Edition. Confrontation does not force a person to deal with you, but places them before the Lord. ← What are our privileges as Christians?